Margaret Atwood. Photo by Liam Sharp. 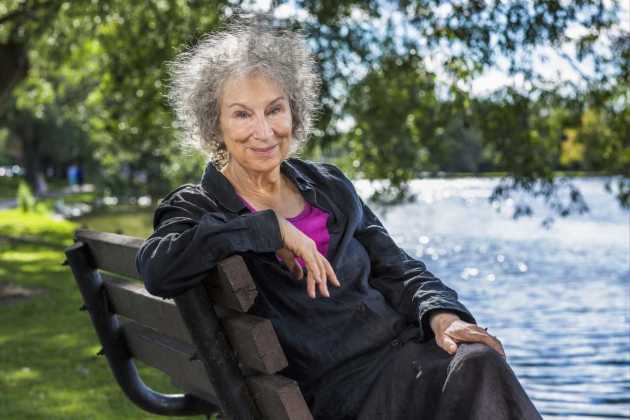 Canadian writer Margaret Atwood has announced that she is writing a sequel to her bestselling novel, "The Handmaid's Tale." The sequel, "The Testaments," is set 15 years after the end of "The Handmaid's Tale." It will be published in September 2019 by Doubleday. "THE TESTAMENTS is set 15 years after Offred’s final scene in The Handmaid’s Tale and is narrated by three female characters. It will be published on September 10, 2019 by Nan A. Talese/Doubleday with an announced first printing of 500,000 copies and price of $27.95. The book will be published in hardcover and as an ebook, and in audio by Penguin Random House; it will be published in trade paper by Anchor the following year. When Donald Trump was elected in November 2016, Handmaids became a symbol of the movement against him, standing for female empowerment and resistance in the face of misogyny and the rolling back of women’s rights around the world. In 2017 the TV adaptation of The Handmaid’s Tale starring Elisabeth Moss and Joseph Fiennes launched in the US on Hulu and Atwood’s novel has spent 88 weeks back on the New York Timesbestseller list. The TV show has been nominated for 18 and won 6 Emmy Awards across two series. A third series is currently in production. The Testaments will be published simultaneously by Penguin Random House across the English-speaking world: by Chatto & Windus/VINTAGE in the UK, Australia, New Zealand, South Africa and India; McClelland & Stewart in Canada; and Nan A. Talese/Doubleday in the US." Atwood was recipient of the 2017 Ivan Sandrof Award from the National Book Critics Circle.